A GROUP OF 350 Central American migrants have forced their way into Mexico, as a new caravan of around 2,500 people arrived. Some members of the caravan had a “hostile attitude” and had attacked local police in the town of Metapa de Dominguez after crossing the border from Guatemala, Mexico’s National Migration Institute (NMI) said. “Today at 3.30 am (8.30am Irish time) a group of approximately 350 people broke violently across the Mexican border from Guatemala,” NMI said in a statement. With an aggressive attitude, [the migrants] broke the padlock on the border gate and entered the country. The migrants were later escorted by Mexican federal police and the civil protection service, according to an AFP correspondent. The caravan first set off on Wednesday from the Honduran city of San Pedro Sula. It picked up Guatemalans and some Nicaraguans along the way. Some of the migrants cross the bridge over the Suchiate River, which divides Mexico from Guatemala. Others jumped into the river and forded across, or paid raft operators to ferry them over. The migrants then headed onto a local highway and began the long trek across Mexico. Some travelled up to 4,000 kilometres, depending on what route they took. This is the latest in a series of caravans trying to reach the US-Mexican border. Trump, who says there is a crisis on the border, has declared a national emergency over the flow of undocumented migrants and illegal drugs into the US, deployed troops to the border and repeatedly threatened to close it. 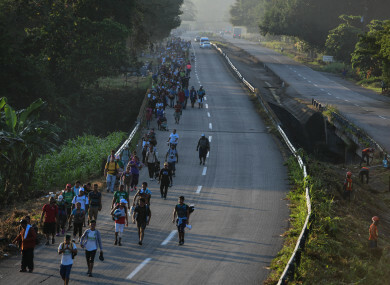 The biggest migrant caravan to date also forced its way into Mexico last October, when migrants broke down a series of border barriers. That caravan, which grew to more than 7,000 people, also tried to force its way into the US, in a New Year’s eve rush. However, US border patrol agents forced them back with tear gas and bullets. 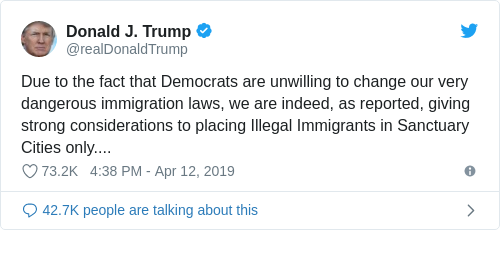 Meanwhile, Trump today said is he seriously considering funnelling detained illegal migrants into the self-declared sanctuary cities that oppose his tough immigration policies. Sanctuary cities are places where local authorities – usually Democratic run – have refused to hand over illegal immigrants for deportation. His announcement on Twitter reversed a previous White House assurance that the idea – criticized as political retribution against cities led by opposition Democrats – had been dropped. The Washington Post had earlier revealed the proposal. The number of immigrant detainees in ICE custody has approached 50,000 in recent months, the Post said. Email “350 migrants 'break violently' into Mexico as new caravan arrives”. Feedback on “350 migrants 'break violently' into Mexico as new caravan arrives”.